The VLM320 operates optically without contact, and implements the principle of the spatial filter by means of the use of a CCD sensor. Spatial filter is the generic term used to describe a measuring principle for the non-contact determination of the velocity and length of moving materials. The spatial filter is based on the filtering effect of grid-like structures (grid modulation). h the objectiveonto the CCD sensor. by an integrated light source (LED). External light disruptions are effectively suppressed with this method. When the object is moved, a signal frequency is generated due to grid modulation. This frequency is proportional to the velocity at which the object is moving. 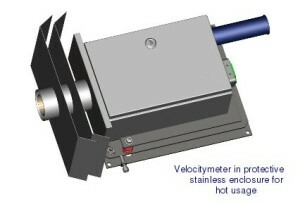 The device measures the signal frequency and converts it to a velocity value. There are several control circuits that enable automatic adjustment to the most varied of materials (material surface structure and brightness).